Time for a Kick up the Rear? For Welsh rugby supporters, the last few weeks have been (in the words of the old Chinese curse) interesting. Despite being the reigning champions, they were well beaten by Ireland, to the extent that they were never in the game. As always in these circumstances, it is difficult to assess if this was because they were so bad, or because Ireland were so good. Come last Friday Wales beat France convincingly – highlights here for those in the UK. So what changed? Among other things, coach Warren Gatland did two things. He accepted that the coaches should take some of the responsibility. At the same time, he spoke to individual players about their shortcomings, and made it clear that some players might not play again after the next match if performances did not improve. Public comments by several players both before and after the game commended him for his honesty, and for his direct approach. And something certainly galvanised the team. Can a carrot and stick approach work in the modern age? It appears so – but with caveats. First, Gatland, as a leader, has been in post since 2007, so he and the players know each other. Second, the players thought his comments justified, and indeed themselves picked apart the team performance behind closed doors. Lastly, he gave the players the chance to redeem themselves. What this illustrates is that where both leader and team have integrity and trust, glossing over failure to meet required standards does not work whereas confronting it does. An interesting story in the Telegraph today, following a CIPD report on the erosion of trust in leaders. This obviously follows on from reported issues at Barclays and other major companies. Startlingly, only 36% of those surveyed trust their senior management. This had a knock on effect on engagement, and the willingness to commit to the job. Where I disagree with the interpretation is on its comparison to “command and control.” In my view, loyalty and trust are important components of performance even if the boss can have you shot. Otherwise, people will just do the minimum to avoid sanction. It may just be that I am getting old, but there seems to be a general weakening of trust across society. Yet a functioning free society depends very much on trust. If you are a leader, or aspire to be, you need to ask why your followers should trust you. Do you demonstrate integrity, or do you take advantage of people? Do you keep your word? Remember that it is easier to lose trust than to build it. Last week was mostly very enjoyable, spent on a led walking holiday in the Scottish Highlands. The leader was experienced, and had climbed all of the Munros. 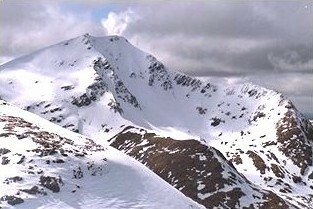 The problem came on Tuesday, on Ben Lui (pictured). In misty conditions, he led us along a path that became steeper, and petered out. We ended up on a very steep, wet and grassy slope, where one of the party slid some 30 feet. Luckily she avoided injury. Since there was no way to the top of the mountain, we had to abort the attempt, and turn back. The result was a loss of confidence in the leader (not helped by one or two more instances of trouble finding the right path, either due to lack of preparation or lack of briefing). Potentially, this could have undermined the group as a whole. (I for one was careful not to spread a lack of confidence). Know where you are going, and how to get there. Remember always that people’s confidence in you can be lost in seconds, but takes a long time to build. It was one of those times when the back page made the front page. Fabrice Muamba of Bolton Wanderers collapsed from a heart attack during their game against Tottenham Hotspur. Nobody expects one of the most athletic young men in the country to suffer a heart attack at the age of 23. I am sure that no football manager has thought (at least until last week) about how to approach such a problem. Coyle had to face a player at death’s door with a family in shock, as well as distraught colleagues. And Bolton and London are over 200 miles apart. Add to that the huge media interest, and the fact that there were scheduled matches to play. Owen Coyle has been magnificent, from removing the media burden from the family, to allowing his players to decide for themselves whether to play in Bolton’s next game. It is in dealing with an unexpected crisis that true leadership is manifested. Every leader should, of course, think ahead about how to address various eventualities. But it is the ability to “play what is in front of you,” to adapt, and to cope with the totally unexpected which is the real test. And Coyle gets an A*. I was at a very interesting talk at Squire Sanders through Birmingham Forward last night. The speaker was Amy Brann of Synaptic Potential. The subject is huge, so obviously Amy was only able to provide an overview, but tying some scientific theory to the more traditional observational approach to leadership was useful. One point she made was that micromanaging people tends to set off the threat response. This increases the use of both oxygen and glucose, decreasing mental functioning. At the same time, cortisol is released, slowing thinking and decreasing immunity. Tied to this is the need for autonomy, or at least perceived autonomy. 3M allow researchers to spend 15% of their time on their own research, while Google allow 20%. This version of motivated autonomy has produced the PostIt Note and Gmail, among other products. Again this is not new, but neuroscience is justifying (and sometimes challenging) the observational work. The science also provides ways to manipulate clients and staff, again nothing new in itself. How far this is ethical is an interesting question. It strikes me that there are so many people trying to manipulate me (shops, charities, the media, spammers, sales people) that it triggers my own threat response!